The Canaries traditionally consist of a collection of seven islands - Gran Canaria, Tenerife, Fuerteventura, Lanzarote, La Palma, La Gomera and El Hierro, but have you heard about the eighth island, the ghost island of San Borondón? San Borondón is the translated named of an Irish monk and patron saint of sailors, Saint Brendan who lived around 500 A.D. and was from Tralee, the largest town in County Kerry, in what is now the Republic of Ireland. The saint and his followers were travelling the Atlantic evangelising islanders and discovered the island. The story even claims that Saint Brendan discovered the Americas 1000 years before Christopher Columbus, the ghost island even appeared on several maps during Columbus' time. The story is that Brendan sailed off with a group of other monks on a small boat across the Atlantic Ocean. The boat had a wooden frame and was covered with cowhides. The hides had been smeared with grease to make them waterproof. The boat had one sail. Brendan blessed the boat, stocked up on supplies and set off to the west. Along the way, they encountered fire breathing demons, floating crystal columns an visited several islands, on one island, a dog led the monks to a large, beautifully furnished house. There was food, drink and beds for each of the monks but there was nobody else on the island, only the dog. On the next island, they met a man who gave them food and drink and predicted that would be sailing for seven years before returning home to Ireland. On the next island, the travellers stopped on a stony beach and built a fire. As the fire grew bigger, the earth began to move. The monks were in fear of their lives as the island began to shake and sink into the water. They raced to the boat and began to sail away, when they looked back, they saw that the island was really a giant sea creature. Based on the stories and poems about St Brendan, Irish sailors would have reached the shores of North America, Iceland, The Canary Islands and maybe others in the Atlantic, and achieved all of this in the Middle Ages. When the Spanish conquered The Canary Islands in the 15th Century, they discovered that the native Guanches had a story about an eighth island sometimes seen to the west of La Gomera, El Hierro and La Gomera. Sailors had tried to reach it, but it vanished or became cloaked in mist. The Spanish connected the Guanche story, to that of Saint Brendan and named the island San Borondón. The belief in the island was so strong that in official documents relating to sovereignty, the Canary Islands had the addendum "already discovered or yet to be discovered" just in case. 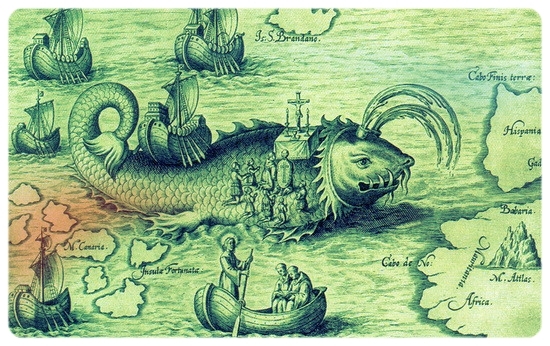 Most academics regard "The Voyage of St Brendan" as a religious allegory, but some believe that the story is true with an added Irish elaboration. When future sailors, including Columbus tried to find the island and failed, they theorised that maybe St. Brendan had in fact sailed right across the Atlantic and was in fact in North America, and that the Irish had visited North America before the Vikings landed there in 1000A.D. Don't Take Your Dad To A Concert!